I saw a recipe for cinnamon roll cake on Pinterest the other day. Now I don't know about you but I LOVE cinnamon rolls, but unless my baby sister is around I don't ever get any. I just don't have the time or the desire to slave over them for a day. So I had to give this recipe a try. The original recipe comes from Six Sisters Stuff. I would definitely make it in a sheet cake and not in a 9x13 pan. But in order to do that you will need to double the frosting and maybe even the cinnamon mixture that goes on the top. To save time you could probably get away with using a white cake mix. This cake was pretty dry as well but by making it in a sheet cake I think the dryness would not be a problem anymore. 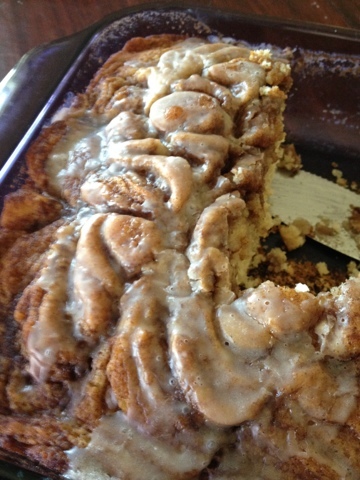 So if you LOVE cinnamon rolls and want a quick fix this definitely was a hit at our house!